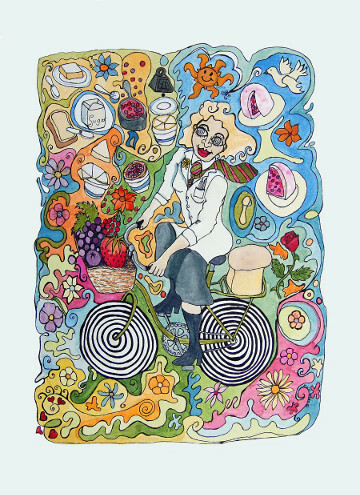 Postcard of a lady dressed as Dr Hoffham on a bicycle, with all the ingredients she needs for a psychedelic summer pudding. Postcard of a lady dressed as Dr Hoffman on a bicycle. She's carrying home all the ingredients needed for a psychedelic summer pudding, including fresh berries (boil with lots of sugar) and bread. Slice the bread, pour the berries in-between and put a plate on top to sqeeze it all down. Keep in the fridge overnight and serve with fresh cream.